It’s knights vs samurai vs Vikings in Ubisoft’s latest cataclysmic multiplayer game, but how is For Honor’s PC performance? Have the Montreal-based studio spent years honing it like a master blacksmith with a steel blade, or is it the jagged iron sword of a journeyman apprentice? We’ve challenged For Honor to pass the PCGamesN tech trial, and only the most noble, learned game may pass our stringent criteria. Like to clash with friends and foes online? Try the best multiplayer games on PC. 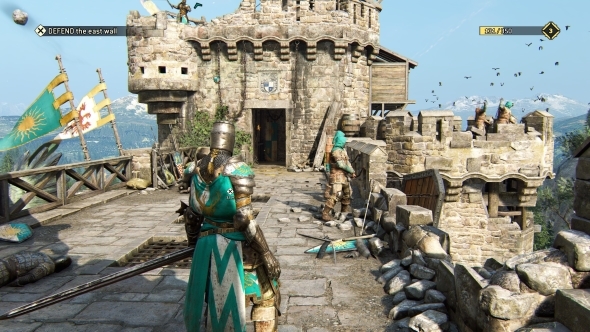 Ubisoft have kept the graphics options in For Honor slim and simple with just 12 options. It’s a far cry from Watch Dogs 2’s 20 options, and no doubt there will be perfectionists out there that miss that little extra control. Regardless, everything we’d demand from a PC port is present and correct. Presets from low to ‘extreme’ are available, and a tap of F1 will auto-detect your system to create a default set-up. Quality for textures, environmental detail, and shadows are adjustable through a series of various options. There’s the typical anti-aliasing and ambient occlusion process settings, too. Helpfully these are all presented in a left-to-right menu that clearly identifies that the further right the option, the better it is. Tool-tips display for every setting, which is something I wish other developers would adopt; they plainly explain the benefits of turning a process on or off. Also included is a VRAM usage meter, which appears to be standard practice in Ubisoft PC games. It allows you to see how far you’re pushing your graphics card at a glance, and is something I think that should be included in every PC graphics menu. Similarly, For Honor also has a benchmarking tool, another feature that ideally would be standard across the board. In other menus you can freely play around with controls, how the game is displayed, and what elements make up the HUD. Overall, For Honor is sporting a very robust collection of settings. For our graphics analysis we compare screenshots taken on the four standard presets of ultra, high, medium, and low. These are easily selected from the graphics menu, although in the case of For Honor the highest setting is known as ‘extreme’ rather than ultra. As with most modern games you will need to restart your session or mission if you make changes to the texture quality. As you can see, For Honor is an exceptionally detailed game. There are numerous types of materials and surfaces, from cloth tabards and metal helmets to wooden staircases and flagstone floors. All of these are lavishly recreated, and the highest level of detail really does these justice. Armour has tiny details like pitting, while the stones in the walls of the fortress are tessellated to look bumpy and uneven. At 1080p, a GTX 1060 will push 79 fps on average, which is a pretty respectable result considering the level of detail. 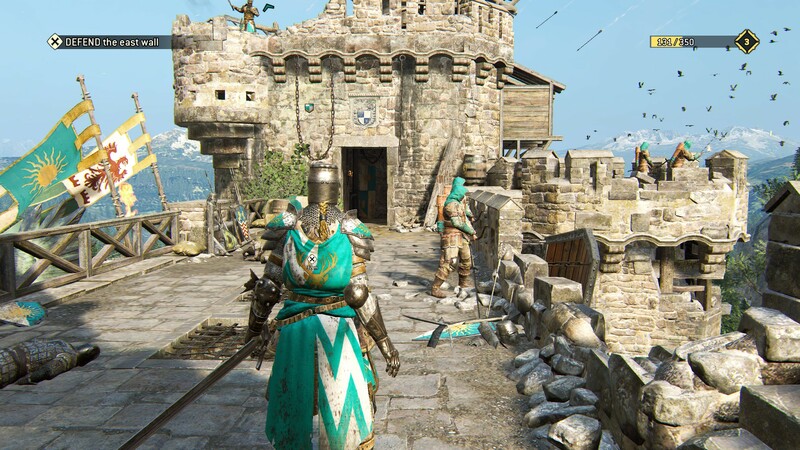 For Honor is a game where there’s perpetual movement, be that the fluttering of flags or the undulating hordes of soldiers storming a courtyard. There’s a lot of pressure being put on a GPU, but there’s no worries about not hitting 60fps here. This scene still looks excellent at high settings, but there are some discreet details that are sacrificed. The shadows cast by the chain hanging on the far wall is gone, as is the shading over the shrub below the round corner section. You’ll also notice an absence of shading in the stonework on the right hand side of the scene, and less darkness in the timber beams to the top right of the building. High settings sacrifice shadow and geometric detail for performance boost, and the return on investment is substantial. On a similar system our our test rig you’ll see an average fps of 109. That’s quite a jump; indeed, the minimum fps the benchmark test recorded was 75 fps, which is practically the average on extreme. In such a competitive game, where reactions are everything, it’s probably a worthwhile trade-off. There’s less of a dramatic change between high and medium. In fact, there’s barely a difference between the two. While you will find the settings have drifted down in the menus, with texture filtering lowered to anisotropic 4x and everything else at their middle-of-the-road options, the visuals remain very solid. Again, the noticeable changes are in the shadows. The bigger stones in the wall to the right-hand side have practically no shading, and there’s less prominent shadow work in the overhang at the top of the turret wall. The very minimal change is evident in the benchmark results, which show an average frame rate of 115. For such a small gain, it seems senseless choosing medium over high. At its most basic graphical settings, For Honor loses much of what makes it a great looking game. Without anti-aliasing the world looks overly sharp, making it incredibly obvious that this is a digital recreation rather than a genuine castle. The block work has angular, jagged edges rather that smoothed, eroded lines. Shadows are practically non existent, and the reduced quality textures make the player character’s chain mail look like a smeared armour-patterned blanket rather than linked loops of metal. The reduction in graphical punch does increase the frame rate to an average of 167 fps, so there is a solid return for the trade. 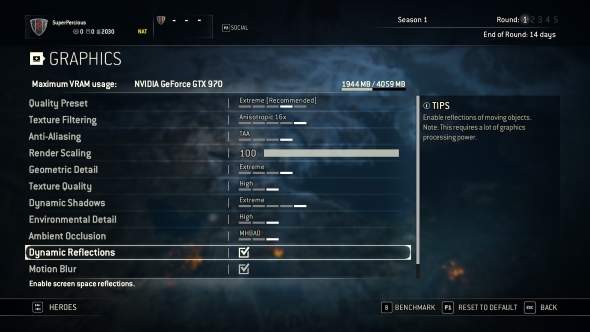 Certainly not worth it if you have a GTX 1060, but for anyone with older hardware this demonstrates that playing For Honor is still well within grasp. To see how For Honor performs on various hardware setups, we have tested the game on four graphics cards; two from Nvidia, and two from AMD. We’ve sampled the most popular cards from the current and last generation of GPUs in order to offer the most useful information. All four cards were tested at extreme settings, with every texture option up as high as they’ll go and every graphical effect turned on. For the test we used the game’s benchmarking tool, which uses scenes of various complexity, including exterior and interior locations, and crowd shots. The graph shows that all cards have strong performance on average, but can dip into fairly low figures. 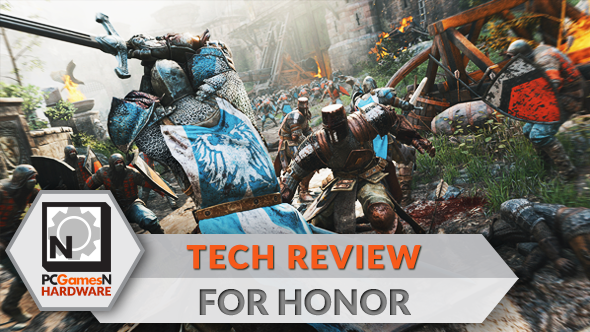 79 fps is a strong showing from the GTX 1060, but in For Honor 21 fps can be a distinct disadvantage. These figures don’t show the complete story, though. The more benchmark tests we performed, the closer the figures eventually became. It appears that For Honor performs best when your GPU has ‘warmed up’ a bit. For example, after a couple more tests on the GTX 1060, we saw a continual average of around 79 fps, but saw the minimum frame rate settle in the high 50s. It’s an odd phenomenon, but one that – on the whole – shouldn’t negatively affect you in the long run. It’s worth noting that despite For Honor’s busy sequences, the older cards in the test still performed well, with the R9 380 offering up a respectable 55 fps on average. That can be easily boosted (see the next section), but being so close to 60 fps while running everything with all the bells and whistles is no small feat. 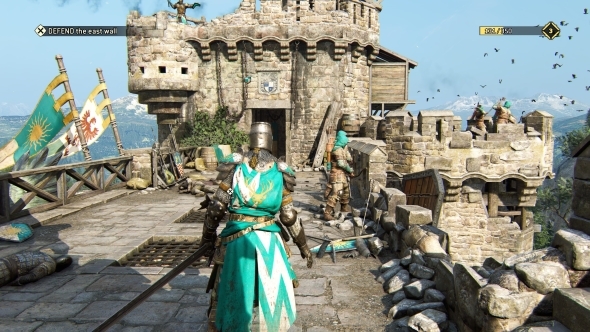 If you’re finding For Honor’s frame rate is fluctuating a little too much for your liking, or your hardware just can’t hit 60 fps on extreme settings, then there’s just one thing you need to do: turn off dynamic reflections. It is, by Ubisoft’s own admission, the game’s most intensive graphical process, and eliminating it will improve your performance by miles. You almost certainly won’t notice it has gone; all it does is reflect motion in shiny surfaces like puddles, and the overall effect doesn’t make the game any more immersive. For a breakdown of how to run For Honor at 60 fps, see our settings guide below. Nvidia’s 9-series GeForce card is perfectly capable of hitting 60+ fps at extreme settings without any help. However, if you’re willing to turn off dynamic reflections, you can achieve in excess of 90 fps, and ensure your minimum frame rates are much, much higher. As our best-performing test card, there’s naturally no need to make any changes to the standard extreme options. Such settings are, after all, the default ones selected by the auto-detect system. However, as with the GTX 970, turning off dynamic reflections offers a performance boost you shouldn’t ignore. Your minimum fps will be far more favourable, which is the most important gain, but you’ll also attain an average of more than 100 fps. 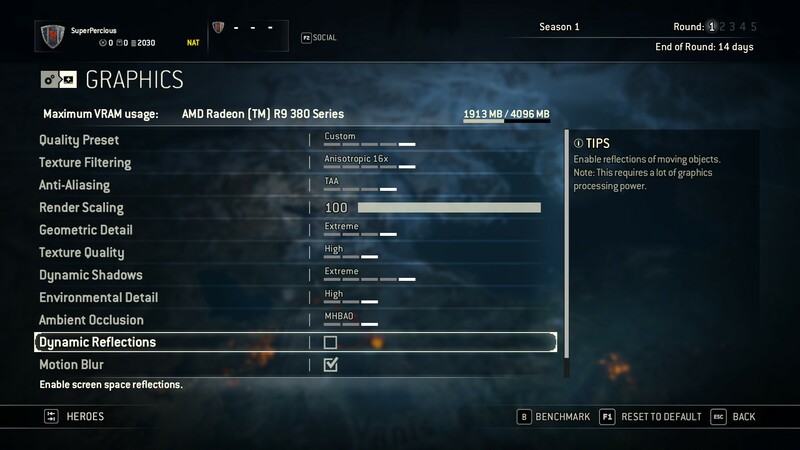 AMD’s last-gen card can’t quite scrape 60 fps at extreme settings; it averages 55 fps and drops as low as 16 fps. With For Honor essentially being a fighting game, such drops are going to dramatically affect your ability to play, so it’s worth making a few tweaks. Thankfully the same advice applies to the R9 380 as to the other cards; simply turn off dynamic reflections. You’ll see an average frame rate of 72 fps, and a far healthier 42 fps at minimum. An RX 470 just about scrapes by the golden standard, clocking in at an average of 66 fps. It does drop as far as 26 fps though, so that classic remedy of disabling dynamic reflections is certainly advisable here. Sacrificing those will net you an average of 88 fps and a minimum of 68 fps, guaranteeing you far more stable performance for when you’re on the battlefield. That could be the difference between dominating and defeat. How does For Honor run in 4K? For Honor, despite a few dips, runs pretty well at 1080p. But how does it fare at 4K? Our UHD test rig – rocking an i7 6600K CPU, an Nvidia GTX 1080, and displaying on an Acer Predator 4K monitor – copes, but only just. 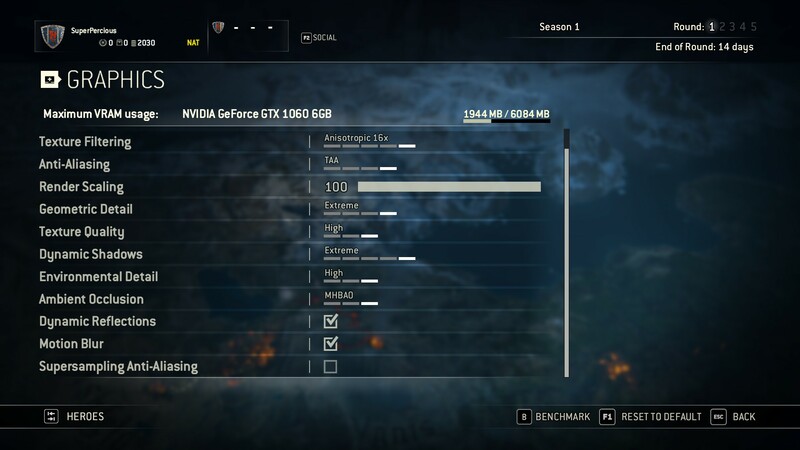 At 3840 x 2160 on extreme settings, For Honor runs at an average of 40 fps, and at a minimum of 30 fps. Those rates are probably fine if you’re just playing through the single-player campaign, but certainly not ideal for duelling online. Again, adjusting dynamic reflections will certainly help you out, but it shows that For Honor really does require some GPU grunt at 4K. As we know, models below the GTX 1080 aren’t really made to be 4K performers, so if you’re equipped with anything less you’d shouldn’t expect a smooth ride at UHD resolutions. For Honor is an intensive game; you’ve only got to look at the detail in its armour models to realise that. And with such graphical intensity comes some drawbacks, especially on the kind of mid-range hardware the majority of gamers are using. As such, For Honor’s frame rate is a touch on the bouncy side. Rarely is it enough to impact your enjoyment, but don’t be surprised if your benchmark test reports some startling low minimum rates. Despite this, you’re going to find that For Honor performs well on the whole. There’s also the odd issue that, from what we can see, the longer For Honor runs on your system, the better it performs. Our benchmarks on first boot-up report much lower minimum frame rates than ones done ten minutes later. A weird quirk, but one that thankfully has no real lasting impact. For Honor gains real brownie points in its graphic menu options. It’s an absolute joy to open up a big triple-A multiplatform game and discover it has a benchmark tool, a VRAM meter, and detailed tool-tips for every option in the menu. For anyone who’s unsure of what each setting does, this is incredibly helpful, and provides information useful for when tweaking other games, too. Ubisoft have done a solid job with For Honor, then, forging it from worthy materials and engraving it with a few details that place it above other games from similar scale publishers. There may be the odd occasion when it feels like it’ll buckle, but in the end its blade always seems to strike true.